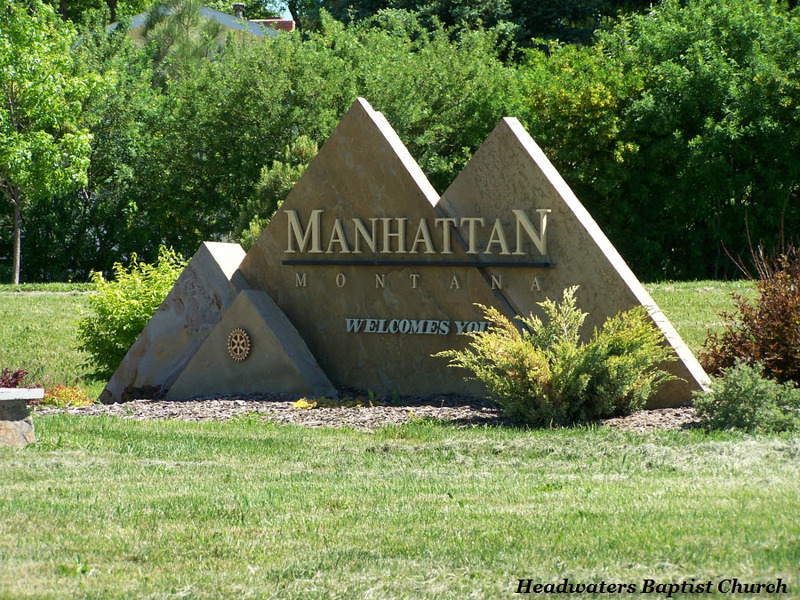 We would like to take a few minutes and introduce you to our town, Manhattan Montana. Manhattan is a lovely small town. 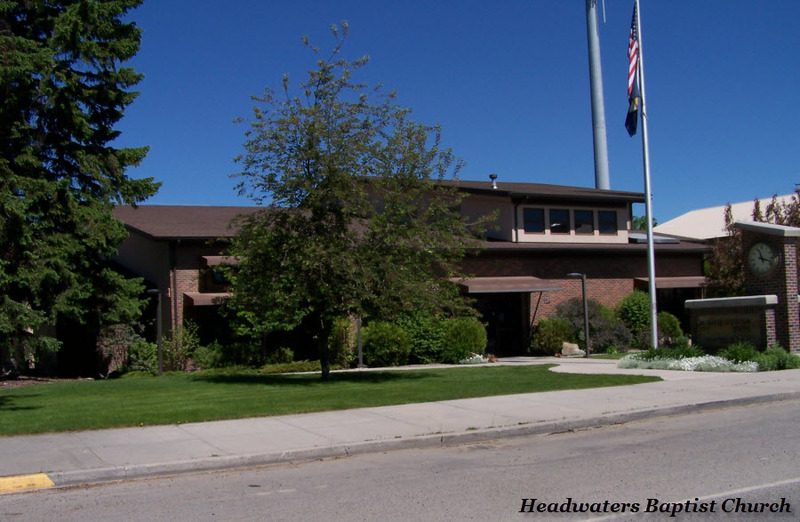 It is home to about 1,520 people and provides a haven from the city of Bozeman to the east. It is between Belgrade and Three Forks on I-90. So take a walk with me and see why if you are moving West we would encourage you to come here! 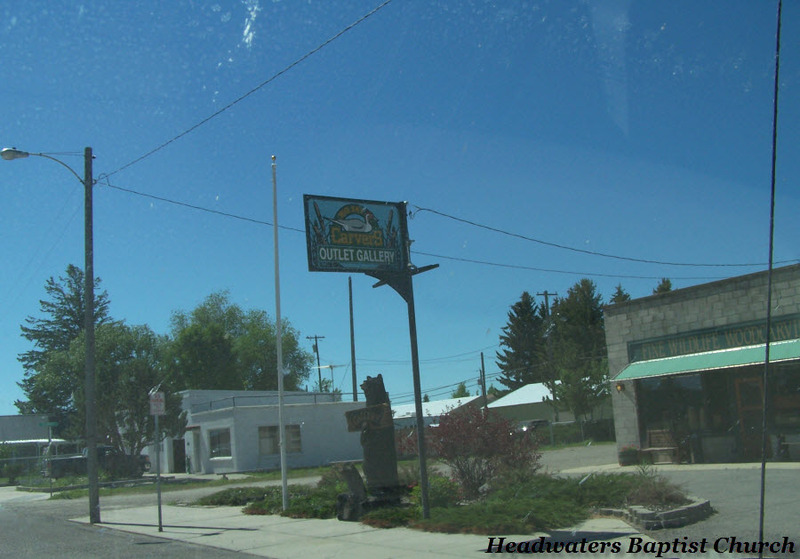 As you get off of I-90 and head into the town of Manhattan MT you will pass this sign on your right hand side. This stone and metal sign replaced our old welcome sign a few years ago. As you pass this sign you will be on Broadway. As you drive a few more blocks you will pass Manhattan State Bank on the left hand side. 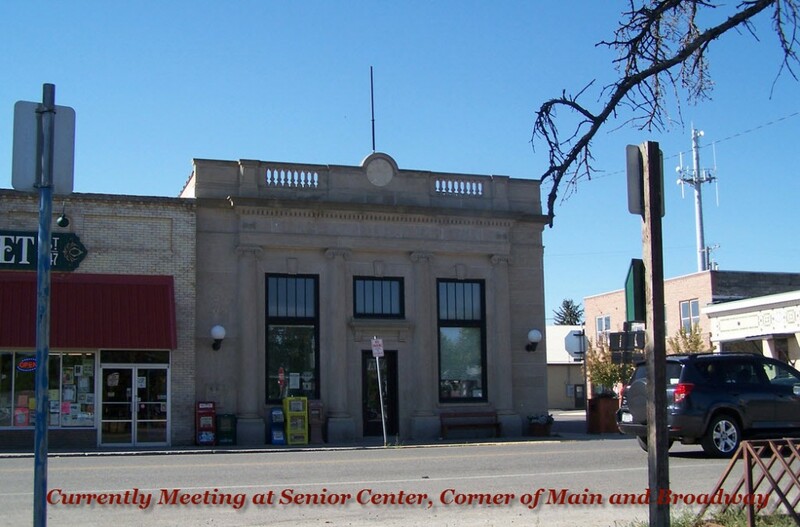 This bank has been part of the community since before the 1970’s. It was once housed in the building that now serves as the Senior Center located at the corner of Broadway and Main. After you pass the Manattan State bank you come to the intersection of Broadway and Main Street. 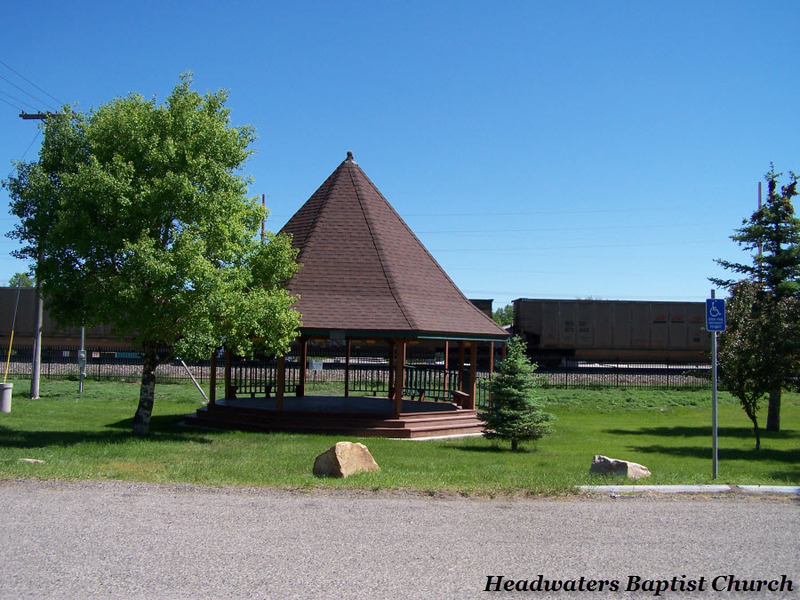 We currently meet for our church, Headwaters Baptist, in the Senior Citizens Center, which was the former bank building back in the 1970’s. It is a stately building of marble sides and pillars on the front. There is a main meeting room upstairs and also a full basement. We are blessed that this building, complete with commercial kitchen, suits the current needs of our church so well. If you are visiting on a Sunday morning you will probably also get to meet our local train. This train comes through town some 5 times per day. Here we see it passing the electric sign on the corner of Main Street. This railroad was the first real means of transportation in and out of the town, other than a horse drawn wagon. The rail cars can be seen carrying everything from coal, gravel, airplane parts, cars, building materials, and other goods. 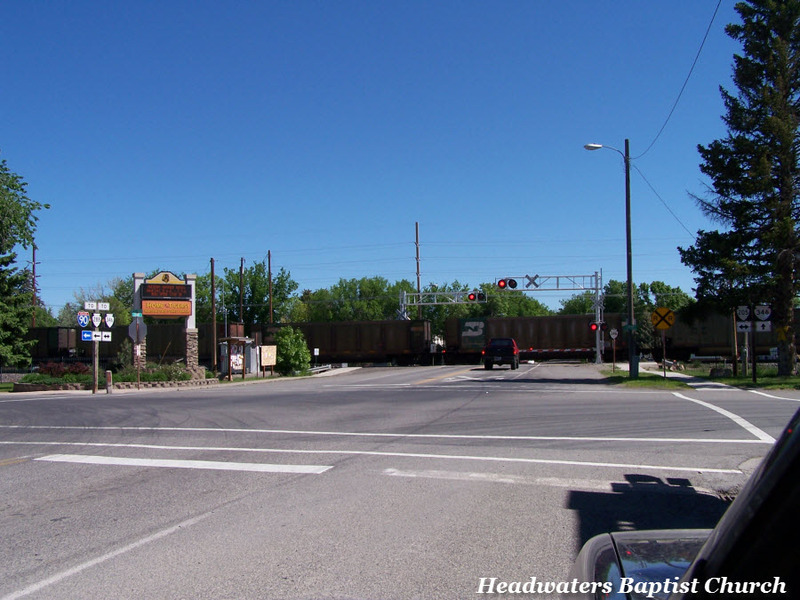 Even today it is a busy set of railroad tracks. Skirting the railroad as it passes through the mists of town is the Railroad Park. 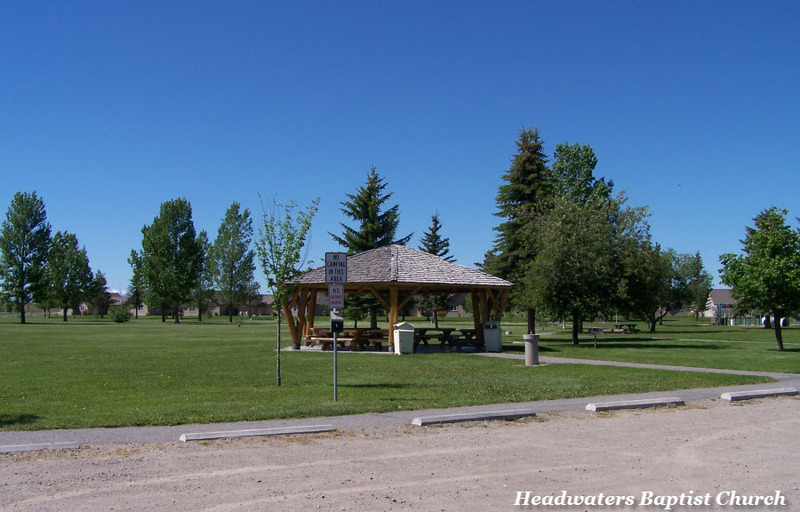 It is a wide grass strip that has benches, trees, and this gazebo which was built a few years ago. During the annual Potato Festival live music is played in the gazebo and vender booths line the grass. Last year a high metal fence was installed which provided a barrier between the tracks and the park, making the park much safer, in my opinion. 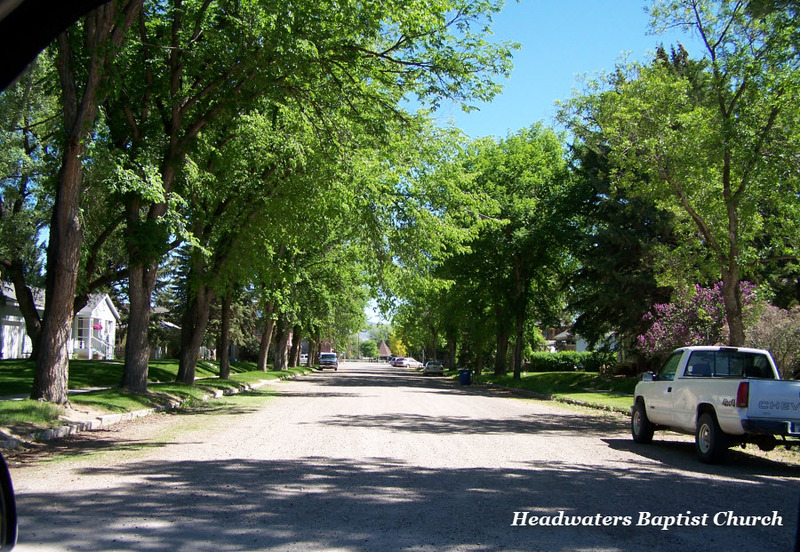 Turning right at the gazebo and pausing to look behind you, you will see a country street lined with tall old trees. This is part of the charm of our Manhattan MT. The big tree lined streets remind us of Mayberry in the Andy Griffeth show from so many years ago. At the end of this street is Taylor Park. This park has a few baseball diamonds, two or three playground equipment sets, paved walking trails, and a bike path. 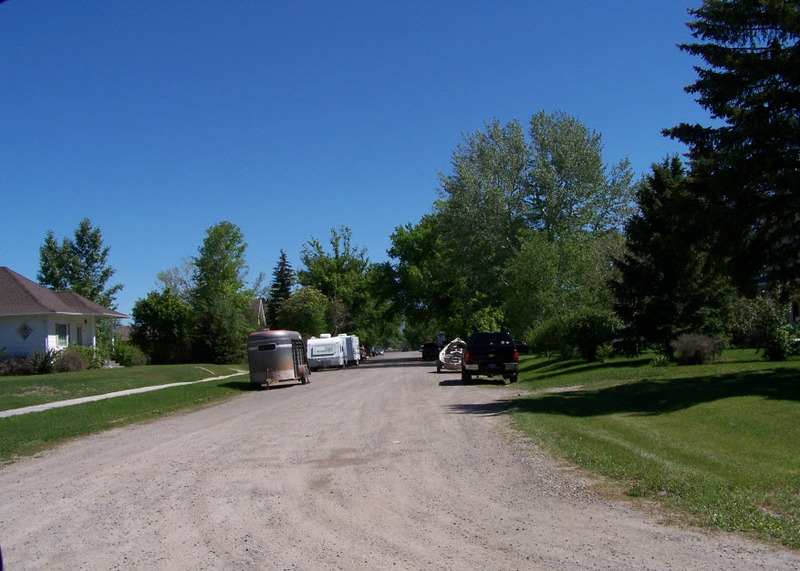 All of these photos were taken in early June of this year so you can see how green and lush this town can be. Last year with all of the fires and lack of rain, our green was more of a brown. Manhattan Montana weather this year, with frequent rainstorms, highs in the 70’s and lows in the mid 40’s, is much more normal for us this time of year than the drought of last summer and fall. Here is a post and beam log pavilion in the park. Beyond to the right is the play ground equipment. In the far back ground is the rear of Park Haven Assisted Living Center. 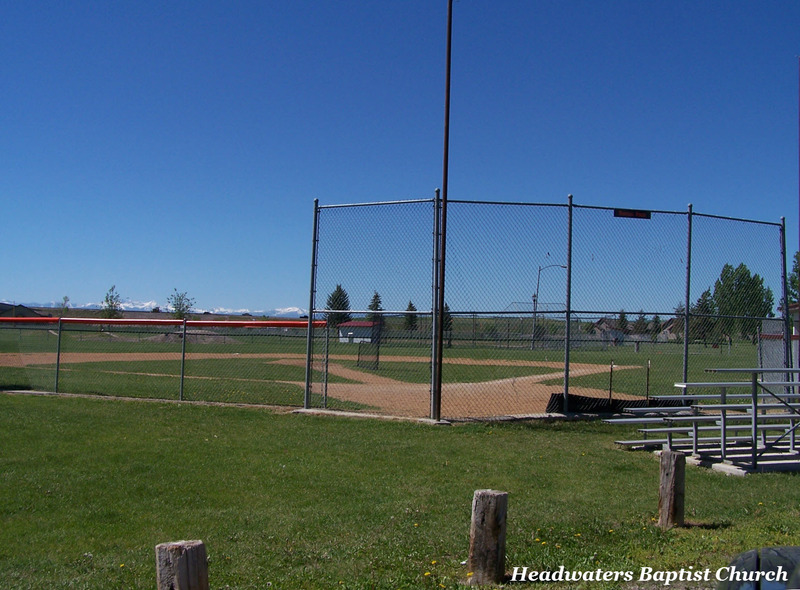 And one more photo of Taylor Park, the baseball diamond comes into view. 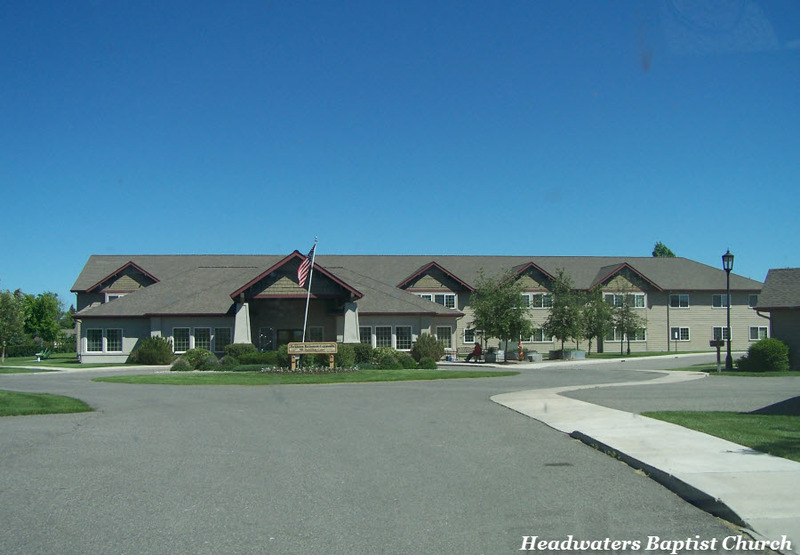 Driving around to the front of Park Haven Assisted Living center the main building can be seen flying the American Flag high. There are also smaller individual cottages around the main center for individual housing needs. This is one of my favorite pictures of Manhattan Montana. This is a side street a few blocks behind the bank. Not all of the streets in town are paved. This one is gravel. But what I love is the things parked along this street. Here we have one float boat, one horse trailer, and two campers. This is SO typicaly of Montana. People move here from all over to enjoy the huge outdoors that we have. Many will live in smaller homes just to get to afford the ‘toys’ for out-of-doors. One of the best known businesses in Manhattan is Big Sky Carvers. Here is not only a manufacturing operation but also thier outlet gallery. If you visit the Outlet Gallery be sure to go towards the back of the show room. That is where dicountiued and sale items are located. Big Sky Carvers are famous for their specialty bears of all sorts that are doing all sorts of things. My favorite is their Bear Nativity Scene. 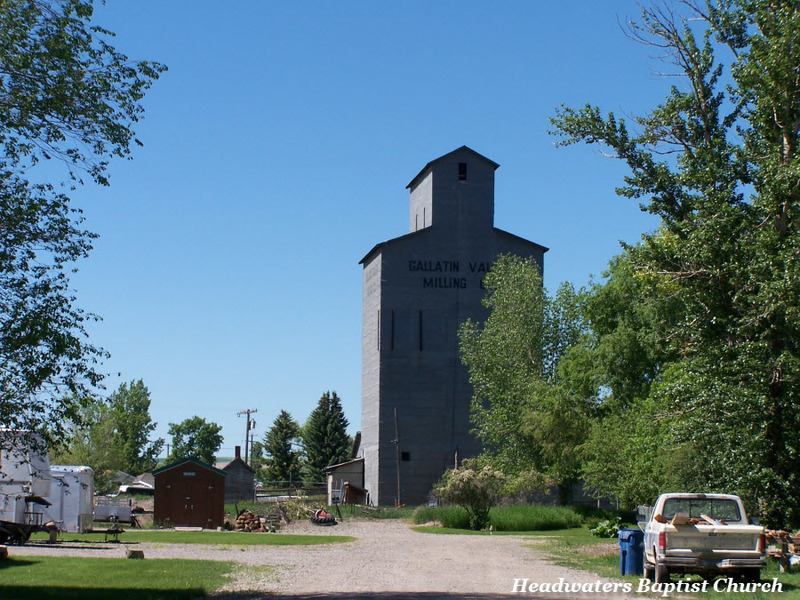 And finally on our walk around town we should also point out the Gallatin Valley Milling Company tower. No longer in business, this tower is a reminder of the agricultural roots of our town. Manhattan was founded by some investors from Manhattan NY, thus the name. Manhattan was originally named Moreland in 1883. Then it was changed to Manhattan in 1890. They grew the grain for malting. The main business in the town was the Manhattan Malting Company which operated until the Prohibition Act of 1916. There is also a strong Dutch influence here with the settling of Amsterdam-Churchill area. There are roads named Wooden Shoe and Dky Road, Windmill Lane, and Canal Road, to name a few. Amsterday-Churchill is included in the Manhattan mailing address if 59741. There is a small ‘town’ area with a small grocery store/ butcher shop, tractor store, Manhattan State Bank branch, and a few churches with roots back to the original settlers of this area of Manhattan. 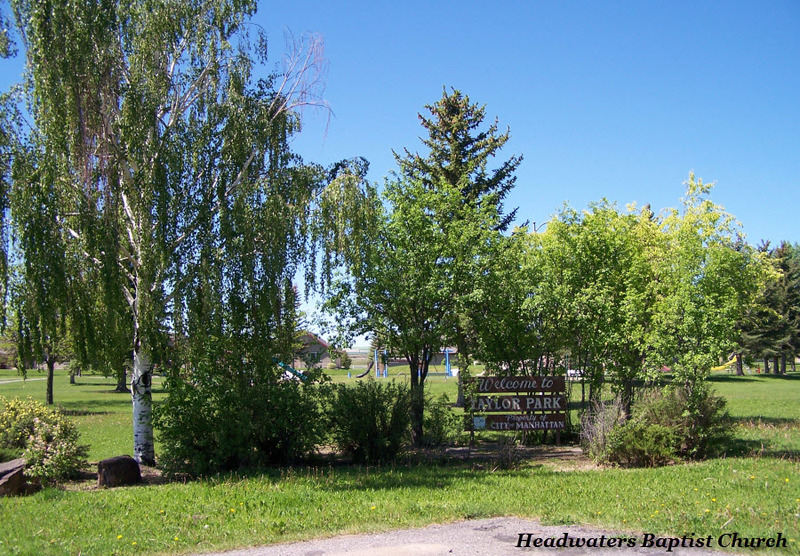 So if you desire to live out West and want a small, clean town to call home, you might consider putting Manhattan Montana on your list of places to stop and visit. We would love to have you!